A while back I saw someone using this interesting device. 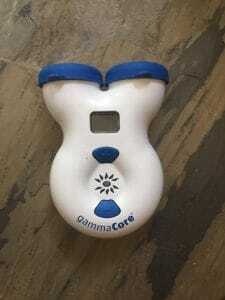 I had no idea what it was and when asked they told me that it was a Vagus Nerve stimulator. It’s been approved in Canada to treat Migraine and just was recently approved by the FDA to treat cluster headache . Vagus nerve stimulation using implanted leads has been approved for a while for treatment resistant epilepsy and depression. Case studies of those who were using it for those illnesses but who also had migraine showed a reduction in migraine episodes for those who use it. Of course, there’s always a cause and effect issue… was it the stimulator reducing the migraine episodes or were the migraine episodes related to the depression and/or epilepsy and as those were treated the migraines also decreased? This new device requires no implantation, you just hold it up near your ear for a few moments. A 2015 study by Straube and colleagues had patients use vagus nerve stimulation for 4 hours per day (similar to what they would receive if they had the implanted stimulator). Almost 30% of those who received treatment at 1Hz saw a reduction in migraine days of 50% or greater. This study actually confused me a bit because there was no baseline group comparison. The patients were split between those receiving treatment at 1Hz and at 25Hz (the 1Hz group saw much better results). The study did not explain why these two frequencies were used or why the higher frequency group may have seen lower results. An earlier pilot study (Goadsby et al, 2014) involved treating migraine attacks with 90 sec doses at 15 min intervals over a 6-wk period. 21% saw pain relief at 2 hours following the first treatment. A 2016 study, by Silberstein and colleagues, examining the effectiveness of the device for cluster headaches compared using the device at the beginning of a cluster headache attack and compared it to a sham device. Results were based on participants having relief from the attack in less than 15 minutes, and also in maintaining relief up to 60 minutes following use of the device. 34.2% of those with chronic cluster headache who used the device saw relief. Unfortunately, those with episodic cluster headache (where I would qualify) did not see relief from using the stimulator. Those in the episodic cluster headache group were more likely to see relief with the sham device. I wrote a post a while back describing the Vagus Nerve hypothesis for Fibromyalgia, so it leads me to wonder how long before we start hearing that this device also helps with Fibromyalgia symptoms. Initial studies show that both implanted and external vagus nerve stimulation decrease both pinprick and pressure point pain. Further studies may show more relief, we can hope. Goadsby, P. J., Grosberg, B. M., Mauskop, A., Cady, R., & Simmons, K. A. (2014). 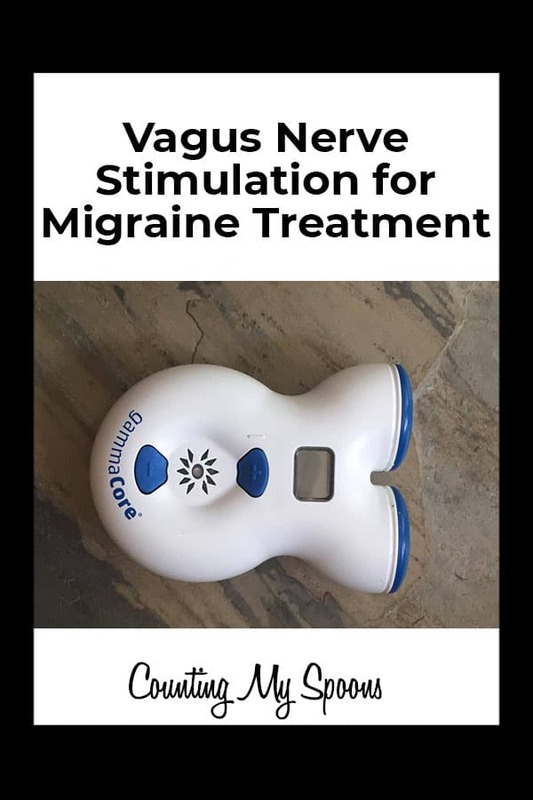 Effect of noninvasive vagus nerve stimulation on acute migraine: an open-label pilot study. Cephalalgia, 34(12), 986-993. Silberstein, S. D., Mechtler, L. L., Kudrow, D. B., Calhoun, A. H., McClure, C., Saper, J. R., … & Tepper, S. J. (2016). Non–Invasive Vagus Nerve Stimulation for the ACute Treatment of Cluster Headache: Findings From the Randomized, Double‐Blind, Sham‐Controlled ACT1 Study. Headache: The Journal of Head and Face Pain, 56(8), 1317-1332. Straube, A., Ellrich, J., Eren, O., Blum, B., & Ruscheweyh, R. (2015). Treatment of chronic migraine with transcutaneous stimulation of the auricular branch of the vagal nerve (auricular t-VNS): a randomized, monocentric clinical trial. The journal of headache and pain, 16(1), 63.